You brought your child to the hospital with the symptoms like wheezing, cough, difficulty in breathing and tightness of chest. Moreover, these symptoms were recurrent and frequent, more during night and precipitated after exposure to certain triggers such as exposure to cold, pets or after exercise and heightened emotions including laughter. There are many conditions which cause some of these symptoms in children. The diagnosis of asthma in your child was made by your doctor after putting together all the symptoms, thorough clinical examination and sometimes assisted by certain test reports. 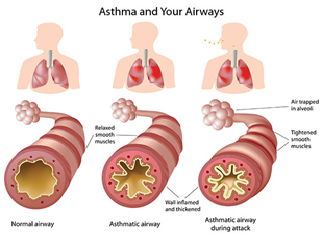 Asthma is caused by swelling in the airways. When an asthma attack occurs, the muscles around the airways become tight and the lining of the air passages swells. This reduces the amount of air that can pass by. Asthma is the leading cause of hospital stays and school absences. Asthma and allergies often occur together. The allergic response plays a strong role in childhood asthma. Viral infections, such as the common cold. Find out how to let your child take his or her medicine during school hours. Having asthma does not mean your child cannot exercise. Coaches, gym teachers, and your child should know how to recognize and treat asthma symptoms caused by exercise. Please ask your doctor on topics of what physical activities your child can engage in school. Long-term control drugs are taken every day to prevent asthma symptoms. Doctors prescribed the medications to relieve your child's asthma symptoms immediately and to prevent future asthma attacks. Call the doctor immediately if your child's asthma symptoms become severe. You should know how to take your child's peak flow reading and what it means. Know your child's peak flow reading that tells you their asthma is getting worse. Know your child's peak flow reading that shows you need to call their doctor.Keep the phone number of your child's doctor with you. Triggers may make asthma symptoms worse. Know which triggers make your child's asthma worse and what to do when this happens. Understand your child's asthma medicines and how they should be taken. Symptoms that interfere with play, sports or other activities. See the doctor when necessary. Check in on a regular basis. Being active is great for your child's health and well being. Sometimes, however, the physical exertion of exercising or playing sport can trigger an episode of asthma. This is called exercise-induced asthma(EIA). Child with asthma should be able to participate in almost any sport or exercise. Scuba diving is the only sport not recommended. Most individuals with EIA can exercise to their full potential if their symptoms are managed properly. Only return to exercise or activity if the symptoms go away. Use the reliever, if the symptoms don't go away, or if they return during exercise. Do not return to any exercise or activity for the rest of the day and see the doctor. Understanding Triggers It is important for both the child and the parent to assess, understand and refrain from getting exposed to the triggers for asthma. Common asthma triggers can be cold or allergens such as - smoke, pets, dust, cigarette smoke, anxiety, pollen, cockroach debris etc. Medications Proper drug administration is crucial for good recovery.Talk and discuss with your allergist or doctor to understand how medications work and what is best for your child. Educate your child and make him aptly able to handle and treat himself during an asthma attack. Air Quality Air allergens can either trigger or aggravate asthma symptoms. If the outside air is polluted, use a mask. Within the house, you can improve the air quality by using an air humidifier. Clean and replace the room AC filters as recommended by the manufacturer. Keep your house dust free and clean. Weight Management Keep a check on your childs weight as weight gain can aggravate the asthma symptoms and may also lead to other complications. Reflux Heartburn or acid reflux can worsen the asthma symptoms.Talk to your doctor to learn more of how to control it either through diet or medications. Alternative techniques Yoga, breathing techniques (like pranayama), acupuncture can help manage asthma symptoms. Healthy food habits are important to be cultivated early. Eating nutritious and good food also helps boost the immune system and manage asthma. 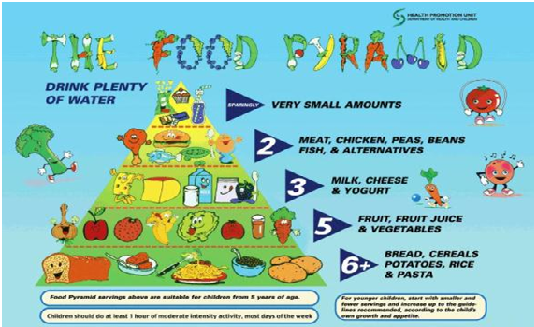 Generally, all food items can be classified into six major groups as shown in the Food Pyramid. 3. Choose foods high in Good Fat such as olive oil, peanut oil, fatty fish, walnuts, flaxseeds. If you do not eat fish, talk to your doctor about taking fish supplements. These good fats help improve the immune system and manage asthma. 4. Include foods rich in Calcium, as this is an important nutrient for development of bones. Milk, yoghurt cheese, green cabbage, mustard greens, black eyed peas are some examples of calcium rich foods. 5. Rich sources of Magnesium, Vitamin A, Vitamin E and Vitamin C should be included in the diet to boost the immune system. 2. Refined ingredients like white rice, white flour, maida should be completely omitted from diets. .
4. Avoid Unhealthy Fats such as Cholesterol, Saturated and Trans Fat. Limit from egg yolks, cream, butter, ghee, coconut, deep fried items, whole milk, dalda, vanspati. 5. Slash down any intake of carbonated and sugary beverages like cola, soda, juices etc. 6. Avoid fried, spicy or acidic foods as they tend to increase heartburn. 7. Refrain from packaged food like instant soups, noodles, chips etc. Below is a sample Diet Plan for a child suffering from asthma. Make sure to check the correct portion/serving sizes for each food item. For cooking, try to use either Olive oil or peanut oil. Try not to serve cold dishes or beverages as low temperatures can trigger asthma. Water should be offered with every meal or snack.